What’s in store for Criminal Minds? Recently, showrunner Erica Messer spoke with TVLine about the CBS TV show’s 15th and final season. As reported earlier, the long-running crime drama will end after its upcoming 15th season. 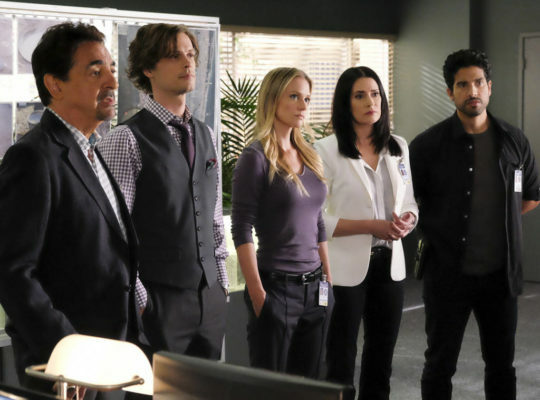 The cast includes Joe Mantegna, Paget Brewster, Matthew Gray Gubler, A.J. Cook, Kirsten Vangsness, Adam Rodriguez, Daniel Henney, and Aisha Tyler. What do you think? Are you a fan of Criminal Minds? How do you want the series to end? I’m so upset to see one of my favorites shows come to an end. I look forward to watching every week. So disappointing! I’m glad it is ending. A lot of the characters are robotic acting, the only one that I will miss is Reid. For instance Aisha Tyler’s character is exactly like the white professor lady before her, and before her it was Rachel Nichols whose character acted the same way. JJ is boring, and Paget, and Rossi. The latino guy has at least some personality, the Asian character is boring. Penelope has personality but she can be annoying after a while. I watch the show but after Reid’s prison storyline it has been filler episodes. I agree 100%! They keep cancelling so many good shows and leaving these half hour comedies and dumb reality shows. I find way more interesting things to watch these days on Netflix, Hulu and Amazon Prime that if a couple more of my favorite channels join Sling TV or the newer, possibly better YouTube TV (which isn’t available in my area YET), why would I continue watching Cable TV, anyway? They are making amazingly stupid decisions lately! I’m on the edge of cancelling cable, myself! I’m sad to see this show end. All previous and current actors have been great to watch over the years. Best of luck to them all. Hopefully there will be a reunion episode in future years. I think that would be awesome episode to watch. It probably wouldn’t end at all if this Erica Messer would just bring Thomas Gibson back as “Hotch”!! That was really dumb on her part!!!! At least we have all the good reruns to watch. “No Hotch, No Watch”. See what happened now???? He was fired, rightfully so. He actually kicked a writer or producer (not sure). Please don’t end Criminal Minds. I love the new team as much as I loved the old team and I have no doubt that there is a long way to go with this team. This is the best show on TV and I have been watching it since the beginning. Why not end that putrid Murphy Brown garbage instead? Excellent idea, LindaB! I like it. They will eventually make their way to Netflix, Hulu, or Prime anyway! Then cancel cable which will kill the networks if we all do so. Win-win for the viewers! The thing is, this is not real life, this is a great show that could go on for a long time from now. None of the shows we watch go by “realistic “ parameters. That’s why we love them so much.